Non-welded roll-mats produced on the Pedax SpinMaster can help save up to 80% of time during on-site installation of surface and wall reinforcements. Surface and wall reinforcements can be installed easily, effectively and quickly using roll-mats, saving expensive reinforced concrete since diameter and bar spacing can be freely chosen. The Pedax SpinMaster produces roll-mats quickly, economically and without effort without welding the bars; the longitudinal bars are automatically joined by means of a wire-tying technique and are wound into a roll-mat. Since the microstructure of the material is not changed, the roll-mats can be used even in structures with changing loads such as bridges, for instance. 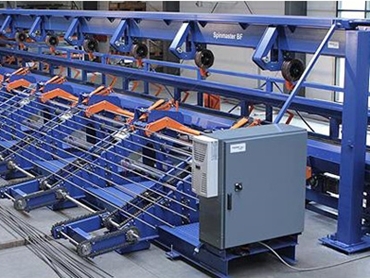 Key advantages of producing roll mats on the Pedax SpinMaster include zero welding; processing of all existing reinforcement steel; individual composition of the mat; savings on reinforced steel due to the free selection of diameter and bar spacing; high degree of flexibility within the mat for easy installation on the construction site; no license fee; and easy one-man, mostly automatic operation. The Pedax SpinMaster is available from Precision Metal Group .